This article was originally published in the Craven Pothole Club Record no. 112, October 2013, pages 7-9. It was reprinted in the Yorkshire Ramblers Journal, Issue 17, Series 13, Summer 2014, pp. 9-10. Most members will be familiar with Wingfield Ledge in the Gaping Gill Main Shaft complex – some from the safety of the winch, and others from their trips down Dihedral and Rat Hole. Not so many will be familiar with the story of the remarkable man after whom it is named. Charles Ralph Borlase Wingfield joined the Yorkshire Ramblers Club sometime between 1906 and 1908, and was an active member until the Great War. His original caving explorations included Wingfield Ledge and Spout Tunnel in Gaping Gill, and Noon’s Hole in Fermanagh, more of which later. He was born in 1873 into the landed gentry class, the eldest son of Colonel Charles George and Jane Wingfield. The family home was Onslow Hall, some six kilometres east of Shrewsbury, a mansion house sat in about 200 hectares of land – alas, demolished in 1957 after it succumbed to a fatal attack of dry rot. His family also owned a fishing lodge in Norway, where he learned to ski. Wingfield was educated at Eton and Trinity College, Cambridge before embarking on the life of public duty and privilege to which he was born. 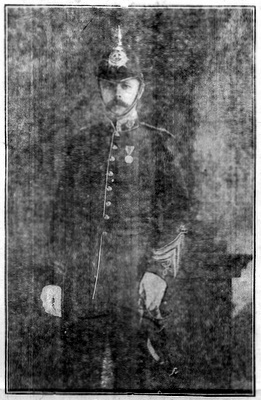 He joined the Shropshire Militia in 1892, an early form of the Territorial Army, where he was promoted to captain in 1908, serving in Ireland in 1910. He was appointed a Justice of the Peace in 1899, when he could have been no more than 26 years old. In 1910 he was sworn in as a Freeman of Shrewsbury, and in the same year he was appointed Mayor without having been elected to the Town Council. He was later elected to the Council, raised to the Aldermanic Bench, and served two further terms as Mayor, in which capacity he welcomed George V to the town in 1914. In 1911 he was elected to the County Council, and in 1913 he was appointed High Sheriff of Shropshire, the oldest secular office under the Crown and the sovereign’s representative in the county. Both his father and his son also held that post. There is evidence that he took to his duties with enthusiasm. In the December of 1910 bad floods hit the Seven valley, flooding many homes around Shrewsbury and causing the postponement of Shrewsbury Town Football Club’s inaugural match at their new ground. Wingfield responded by visiting the flood-bound cottages in a coracle. Wingfield didn’t allow the duties of his public offices and the management of his estate to dominate his life. He played hard, and judging from the Yorkshire Ramblers Journals, he holidayed for at least two months a year. He was a very accomplished skier, and during the particularly snowy March 1909 undertook a ski tour that took him across the moors from Nelson to Sedbergh, via Burnsall Fell, Great Whernside, Buckden Pike, Wild Boar Fell, and Standard Riggs. It took him seven days, and at 96 miles was the longest recorded ski run undertaken in England. He also skied extensively in the Alps. He was part-owner of a 60-ton yacht, Gwynfa, which was crewed by amateurs, and more than once took month-long cruises around the coast of southern England and northern Europe. He was proud to proclaim that he achieved a speed of 90 mph in a 100 horsepower motor car, and he took part in a London-Cowes motor boat race. Despite all this activity, Wingfield found time to attend a large number of Yorkshire Ramblers Club meets before war, and was a regular attendee at the Gaping Gill winch meets, and was involved in a number of new explorations. During the Whitsun meet in 1909, some of the right bank of Fell Beck was washed out, exposing the entrance to Rat Hole. Later in the year, a dam was built to divert the water down the new entrance making ladder descents of the Main Shaft feasible. The dam was broken at the end of the meet, and Wingfield and Addyman negotiated the entrance tube and reached the main Rat Hole stream before retreating when the support party outside signalled the arrival of rain with a revolver shot. They returned the following year, and reached the main pitch which Wingfield subsequently plumbed in 1912 to a depth of about 60 metres. In 1913 a party including Ernest Baker and Wingfield visited Fermanagh with the intention of descending the previously unbottomed Noon’s Hole. Both Martell and Baker had previously tried, and failed. Unfortunately, the Yorkshire Ramblers Club ladders which had been sent out from England failed to arrive. Undeterred, Wingfield suggested that they visit Loch Earne, find a chandler, and buy the raw materials to make their own ladder. This they did, and armed with their new 105’ ladder and plenty of rope for pulling it up and down as appropriate, they managed to reach the bottom of the 250’ shaft. Wingfield left an impression on Baker: "The handy man of the party was always Wingfield. His entire disregard of appearances was an example to us. He rarely shaved, he washed but sparingly, whilst a campaign was in progress; a singlet, a pair of shorts, and boots sometimes oiled but never blacked, always, however, well protected by a layer of cave mud, were his attire throughout our stay at Derrygonnelley." And this was the High Sheriff of Shropshire! It was also in 1913 that Wingfield undertook the exploration for which he is best known, and was one of the most daring of its day. He was lowered on the winch from Jib Tunnel in what he describes as a “breeches”, which presumable means the canvass breeches used in a breeches buoy. A thin rope was attached to the end of the winch wire, and Hastings pulled him over towards the south wall from the floor of the Main Chamber, allowing him to pull himself onto a buttress some 35 metres above the floor. From here, still in the breeches and attached to the winch wire he descended to a couple of chockstones where he was able to belay himself, and extricate himself from the winch cable. Whilst waiting for Booth to join him, he set up a camera and took a remarkable photograph which fully catches the atmosphere of his situation. Once Booth had joined him, he set off along the terrace which now bears his name, some 33 metres above the Main Chamber floor. After 20 metres he reached the Rat Hole waterfall where the water proved to be too much for his lamp, and he had to retreat in semi-darkness. The Great War then broke out, and his regiment, the Shropshire Militia, were mobilised as the 3rd Battalion of the King's Shropshire Light Infantry. Initially he was training troops in Pembroke Dock, but in October 1916 his battalion was sent to Arras on the Somme. Despite having been promoted to Major by this time, he sent himself to the frontline, and is later said to have compared trench warfare with potholing. He survived the experience and finished the war in the UK with the rank of Lieutenant Colonel. He had married Mary Williams in June 1916. As with many of its participants, the war changed the course of Wingfield’s life. He is not recorded as having attended any YRC meets after the war, and he seems to have spent much of his energy looking after the interests of the men who had returned. He was president of the local Comrades of the Great War as well as that of the local branch of the British Legion, and he also helped to found the local United Services Club. He was taken ill in 1923, and died on 1st February after an operation. He died young, without having reached his fiftieth birthday, but he packed more into his life than most people could dream of. He left a widow, two sons and a daughter.